View larger. 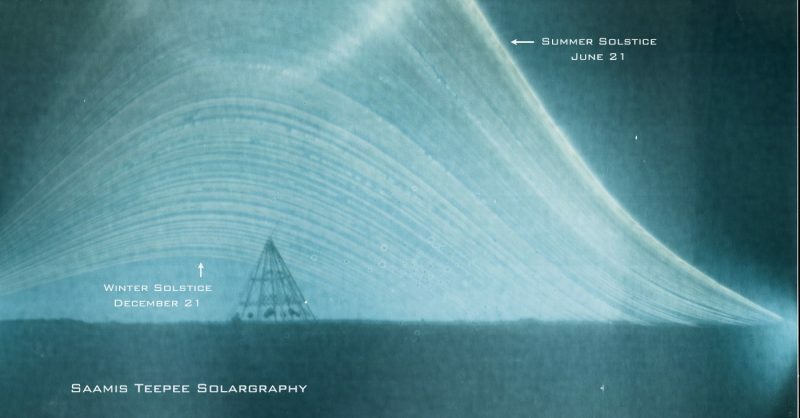 | Ian Hennes in Medicine Hat, Alberta, Canada, created this solargraphy between a June solstice and a December solstice. It shows the path of the sun during that time period. Late dawn. Early sunset. Short day. 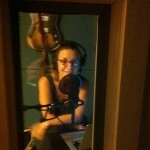 Long night. For us in the Northern Hemisphere, the December solstice marks the longest night and shortest day of the year. Meanwhile, on the day of the December solstice, the Southern Hemisphere has its longest day and shortest night. The 2018 December solstice takes place on Friday, December 21 at 22:23 UTC (4:23 p.m. CST; translate UTC to your time). No matter where you live on Earth’s globe, a solstice is your signal to celebrate. Sunlight on Earth, at the December solstice. North Pole in 24-hour darkness; South Pole in 24-hour daylight. Gif via Wikimedia Commons. When is the solstice? The solstice happens at the same instant for all of us, everywhere on Earth. In 2018, the December solstice comes on December 21 at 4:23 p.m. CST. That’s on December 21 at 22:23 Universal Time. It’s when the sun on our sky’s dome reaches its farthest southward point for the year. At this solstice, the Northern Hemisphere has its shortest day and longest night of the year. To find the time in your location, you have to translate to your time zone. Click here to translate Universal Time to your local time. Just remember: you’re translating from 22:23 UT on December 21. For example, if you live in Perth, Australia, you need to add 8 hours to Universal Time to find out that the solstice happens on Saturday, December 22, at 6:23 a.m. AWST (Australian Western Standard Time). 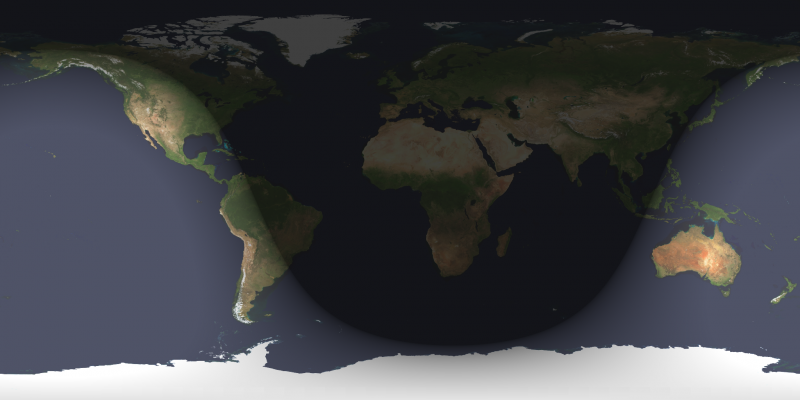 Day and night sides of Earth at the instant of the solstice: December 21, 2018 at 22:23 UTC). Image via U.S. Naval Observatory. What is a solstice? The earliest people on Earth knew that the sun’s path across the sky, the length of daylight, and the location of the sunrise and sunset all shifted in a regular way throughout the year. They built monuments such as Stonehenge in England – or, for example, at Machu Picchu in Peru – to follow the sun’s yearly progress. But we today see the solstice differently. We can picture it from the vantage point of space. Today, we know that the solstice is an astronomical event, caused by Earth’s tilt on its axis and its motion in orbit around the sun. Because Earth doesn’t orbit upright, but is instead tilted on its axis by 23 1/2 degrees, Earth’s Northern and Southern Hemispheres trade places in receiving the sun’s light and warmth most directly. 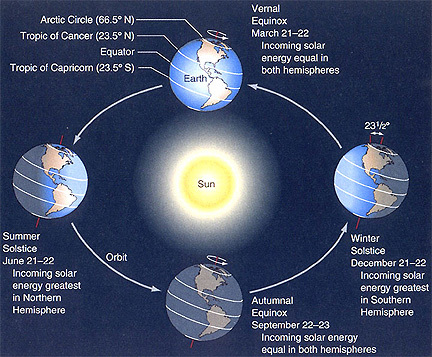 The tilt of the Earth – not our distance from the sun – is what causes winter and summer. At the December solstice, the Northern Hemisphere is leaning most away from the sun for the year. At the December solstice, Earth is positioned in its orbit so that the sun stays below the North Pole horizon. As seen from 23 1/2 degrees south of the equator, at the imaginary line encircling the globe known as the Tropic of Capricorn, the sun shines directly overhead at noon. This is as far south as the sun ever gets. All locations south of the equator have day lengths greater than 12 hours at the December solstice. Meanwhile, all locations north of the equator have day lengths less than 12 hours. 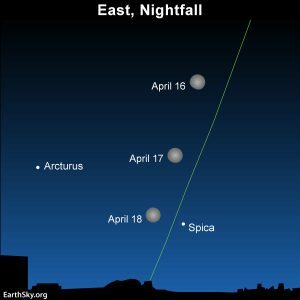 Where should I look to see signs of the solstice in nature? Everywhere. For all of Earth’s creatures, nothing is so fundamental as the length of daylight. After all, the sun is the ultimate source of all light and warmth on Earth. If you live in the Northern Hemisphere, you can notice the late dawns and early sunsets, and the low arc of the sun across the sky each day. You might notice how low the sun appears in the sky at local noon. And be sure to look at your noontime shadow. 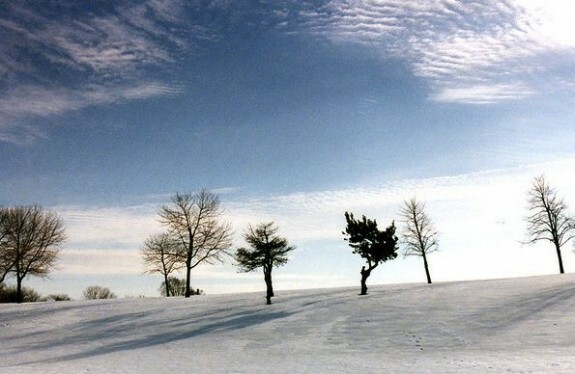 Around the time of the December solstice, it’s your longest noontime shadow of the year. In the Southern Hemisphere, it’s opposite. Dawn comes early, and dusk comes late. The sun is high. It’s your shortest noontime shadow of the year. Around the time of the winter solstice, watch for late dawns, early sunsets, and the low arc of the sun across the sky each day. Notice your noontime shadow, the longest of the year. Photo via Serge Arsenie on Flickr. Meanwhile, at the summer solstice, noontime shadows are short. Photo via the Slam Summer Beach Volleyball festival in Australia. Why doesn’t the earliest sunset come on the shortest day? The December solstice marks the shortest day of the year in the Northern Hemisphere and longest day in the Southern Hemisphere. But the earliest sunset – or earliest sunrise if you’re south of the equator – happens before the December solstice. Many people notice this, and ask about it. The key to understanding the earliest sunset is not to focus on the time of sunset or sunrise. The key is to focus on what is called true solar noon – the time of day that the sun reaches its highest point in its journey across your sky. The discrepancy occurs primarily because of the tilt of the Earth’s axis. A secondary but another contributing factor to this discrepancy between clock noon and sun noon comes from the Earth’s elliptical – oblong – orbit around the sun. The Earth’s orbit is not a perfect circle, and when we’re closest to the sun, our world moves fastest in orbit. Our closest point to the sun – or perihelion – comes in early January. So we are moving fastest in orbit around now, slightly faster than our average speed of about 18.5 miles per second (30 kilometers per second). The discrepancy between sun time and clock time is greater around the December solstice than the June solstice because we’re nearer the sun at this time of year. 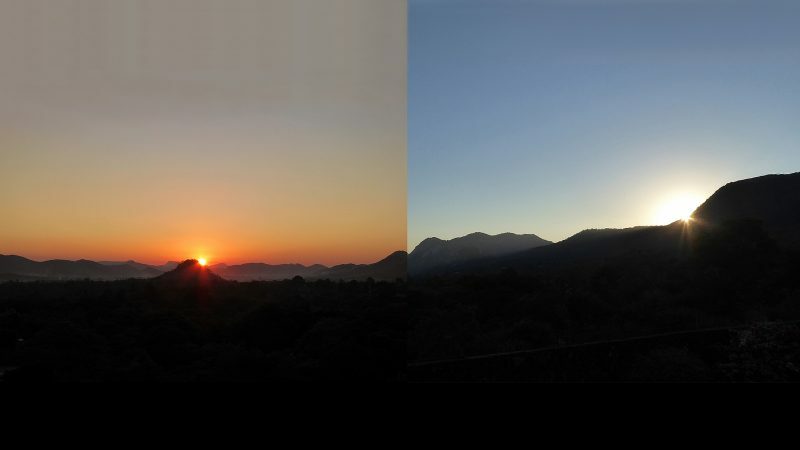 Solstice sunsets, showing the sun’s position on the local horizon at December 2015 (left) and June 2016 (right) solstices from Mutare, Zimbabwe via Peter Lowenstein. 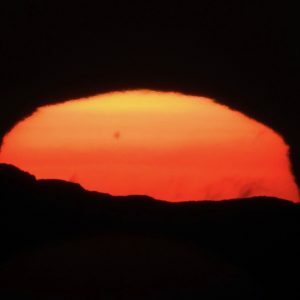 The exact dates vary, but the sequence is always the same: earliest sunset in early December, shortest day on the solstice around December 21, latest sunrise in early January. Bottom line: In 2018, the December solstice comes on December 21 at 4:23 p.m. CST. 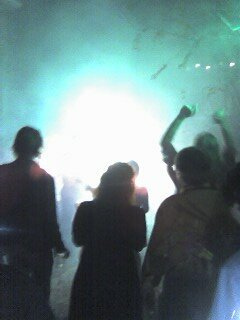 That’s December 21 at 22:23 UTC. It marks the Northern Hemisphere’s shortest day (first day of winter) and Southern Hemisphere’s longest day (first day of summer). Happy solstice, everyone!